New Astro Flight Model 101 Super Whatt Meter! New measuring capabilities! Essential Electric Flight Tool! Onboard voltage monitor designed for 2-6 cells, Lipo with balancing port. Small, light and ultra portable, only 5mm thick including the LCD screen. Capability of cell count, individual cell voltage and total pack voltage, simultaneously for up to 6 cell lipo packs. Also shows voltage total. Precision with +/- 2% accuracy. See voltage and balance of each cell. 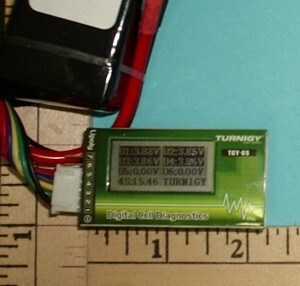 Portable digital voltage monitor designed for 2-3 cells. Handy, small size for use as stand alone monitor in shop or field box. Always disconnect monitor when finished or very small voltage drain can discharge lipo cells too far.